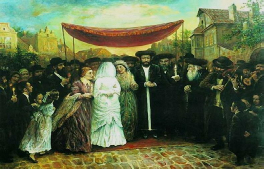 Jewish women have paid a critical role in the development and survival of Judaism and in it being the only religion to have survived for 4,000 years. Not many details of their contribution to Judaism have come down to us. These videos are mainly the stories of a few who played a critical role and whose details have come down to us. Most of the videos below have come from the research of Dr Henry Abramson, the Dean of the Lander College of Arts and Sciences in Flatbush, New York whose work in online education stands out. WHO WAS DONA GRACIA NASI? out of Europe to refuge in Ottoman lands. Orphaned by the Eastern European pogroms of 1648-49, the volatile Sarah became the spouse of the infamous messianic pretender. When a bright young lover of poetry in early 17th century Venice wrote to a senior literary figure, she was ultimately drawn into a public battle over her refusal to abandon her Jewish faith..
political activist for women's rights. Wuhsha the Broker, a Jewish woman in medieval Egypt whose life reflects interesting aspects of the role of women in the economy.